Mickey Mouse On The Menu? Alaska's Big Fish Love'em! Alaskan waters produce large trout, most notably the Rainbow. Genetics are a factor, but the nutritional opportunities for trout in Alaska are beyond compare. The most obvious examples come from returning salmon that enter freshwater streams by the millions to spawn and then die. During their freshwater lifecycle they deposit tons of eggs that are available to trout, then after spawning, every salmon will die leaving its carcass as another nutritional source. Later, as the eggs hatch, the alevin, fry and smolt will become prey as fish pursue another outstanding biomass. During times when there's less food, trout becomes opportunists and mice are a welcome meal. Some species live a lonely lifestyle while others colonize, but they're all prone to overpopulation of their habitat. Alaska's rodents mature and begin breeding at 3 to 6 weeks of age, and have a gestation period of 2 1/2 to 3 weeks producing 2 to 10 young. In a short time, populations can explode causing large numbers to leave in search of a more suitable habitat, which places them within reach of predatory fish. Streams, rivers, lakes and ponds should be obstacles, but mice and their cousins have little fear of the water and swim surprisingly well. Rainbows, Lake Trout, Pike and Char will actively hunt the swimmers, or take mice after they have drowned. A dead drifted pattern can be effective where big riffles or rapids tail into deep pools. Obviously, a poor choice of crossing locations result in drowned mice that wash downstream to waiting fish below. 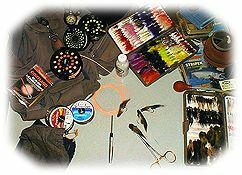 A spun hair pattern will naturally sink below the surface in fast water, or flies pressed into streamside mud with a boot decrease in buoyancy. As with many large patterns, it's a good idea to wait for a brief moment after the take before setting the hook. Often, fish strike the pattern but won't have it firmly in their mouth until after they turn to take it below the surface. Regardless of the method or means, if trout or other predatory fish are looking for mice, it will be an exhilarating experience.